Haven't finished up your wintertime recreation? Springtime snow means you still can. Springtime snow? It's a marvelous sight for boarders at Northstar. A number of Tahoe-area resorts are rocking after the April 7 storm. BUCKET LISTS... tend to extend over the reach of a lifetime, but managing must-dos seems better approached, and accomplished, when they only have to be met over a year or a season or even a month. Time feels more urgent, and of the essence, and rather than delaying that delightful experience for "down the road" -- which could be in a decade or two, because time flies etc. -- you jump on the experience in a more lickety-split fashion. So how did you do with your bucket list over the 2014-2015 winter? Did you consume enough hot toddies? Binge-watch enough quality TV series? And how did that skiing a whole bunch plan go? Not so hot? THANK GOODNESS FOR APRIL SNOWSTORMS, then. They happen, though in this time of drought a springtime flurry of flakes feels even more surprising and more welcome. 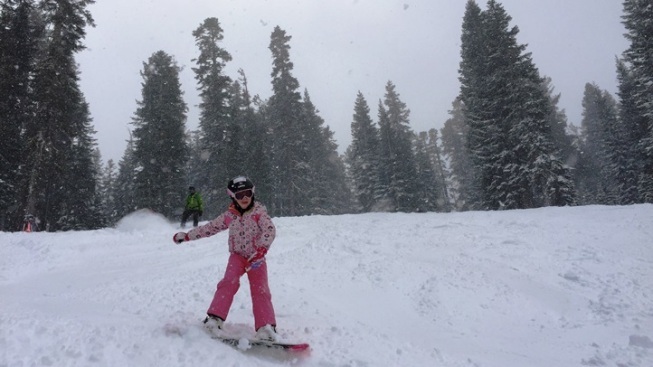 "Welcome" is very much the word at California's mountain resorts following the April 7 precipitation, which brought several inches to several high elevation spots, from Mammoth Mountain to the destinations around Lake Tahoe. Speaking of those destinations, Heavenly, Northstar, and Kirkwood released several snapshots from their slopes, slopes that look more January than the middle of spring. Need to get your board on before summer saunters this way? MAKE FOR THE LAKE... where ten to 28 fresh inches are now powdering things up nicely at the resorts. Resorts, by the by, which are already looking to the 2015-2016 season, with a special pass price to (ski) boot. The deal? Purchase before April 12 and score "the lowest guaranteed price." The adult pass kicks off at $479 and includes "unlimited skiing or riding" at the trio of resorts above (with a few asterisks about blocked-out holiday dates). Need info? Schuss this way. Need to finish out your winter bucket list? You can, if you're pronto about it, snow enthusiasts.